Since the beginning of his career, Arup had been thinking about the relationship between architect and engineer. These days he is seen as a peacemaker between the two in a kind of ongoing struggle. Should the 'artistic architect' dominate the design of a building and get all the credit or should the 'practical engineer' have the upper hand for ensuring it stands up? Can an engineer contribute to the aesthetic decisions? Should architects take more responsibility for structural matters? These questions are still relevant today and the supposed boundaries between the professions continue to be debated and move position. In Britain, the distinction between architect and civil engineer was formalised in 1918. However, when Arup arrived in 1923, the respected status of the engineer that he'd been used to in Europe did not exist to the same extent. Arup's challenge to the UK's status quo even before he was in a strong enough position professionally to assert his opinion was later considered revolutionary. He was by no means alone in wanting collaboration between the two disciplines, nor was it a new idea. Owen Williams was perhaps the first significant engineer in the UK to try to bridge the gap. Another significant figure is Felix Samuely (1902-59), Arup's one-time assistant. Both worked extensively with reinforced concrete, the 'new' material about which engineers in this country knew more than architects did. Various factors contributed to the imbalance in favour of architects, not least the British class system and attitudes to 'trade'. Out-of-date engineering training was another factor. 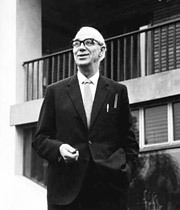 Throughout his career, Arup was outspoken about the need for radical reform in both professions and he focused on education matters as a way to achieve it. Peter Jones, in his biography of Arup, notes that "for thirty years ... Ove had endured the ignorance of engineers and architects in Britain about anything philosophical". Arup criticised the "jungle of British technical education", and was sceptical about the sufficiency of undergraduate training and post-graduate specialisation. Knowing this viewpoint is essential to understanding his approach to his work, and his approach to the people he worked for and with. He also said that, "Specialisation is an evil because it makes a person narrow-minded and makes communication with others difficult ... imagination and invention — essential for a creative engineer — flourish on cross-fertilisation from other fields of knowledge." Arup consistently strove for a true partnership between the architect and engineer, an ideal he called 'total design'. His conscious aim to achieve better design through the formation of an integrated team took collaboration to a new level. Some people point to philosophical origins for the idea in the Deutsche Werkbund and Bauhaus of the 1910s in Germany — an example of Arup's mind working far more closely with European philosophy than British practice. Arup's early career choices are notable in this respect. He worked for contracting firms as a design engineer, bringing engineering and construction together very effectively, especially in the realisation of the possibilities of reinforced concrete. For the Modernist architects, this was very attractive. With them he got his first chance to try for his goal. When he ceased to be an employee and struck out on his own, he set up three companies — a design-and-build firm, a design firm and an engineering consultancy to architects. The first of these lasted through the war, and at war's end he chose consultancy as the way forward. Later an architecural team was formed that became Arup Associates. Now he was a business man as well as an engineer. Still he looked for the perfect partnership between architect and engineer. With Utzon and the Sydney Opera House, he thought he found it. In the end, it wasn't to be, but what a journey he made in search of it. Hugely admired for his technical achievements, for his vision and for his approach to the profession of engineering, his influence continues to be felt throughout the industry.